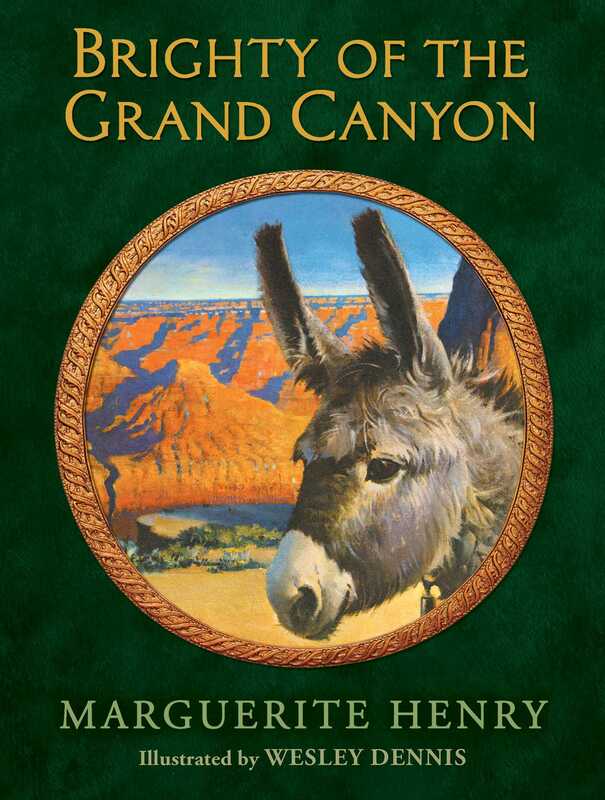 A determined little burro earns the loyalty and affection of everyone he encounters in this classic story from Newbery Award–winning author Marguerite Henry, now in a gorgeous hardcover gift edition. Long ago, a lone little burro roamed the high cliffs of the Grand Canyon and touched the hearts of all who knew him: a grizzled old miner, a big-game hunter, even President Teddy Roosevelt. Named Brighty by the prospector who befriended him, he remained a free spirit at heart. But when a ruthless claim-jumper murdered the prospector, loyal Brighty risked everything to bring the killer to justice. Brighty’s adventures have delighted generations of readers, and he has become the symbol of a joyous way of life. Some people say that you can even see his spirit roving the canyon on moonlit nights—forever wild, forever free. A SHAGGY young burro lay asleep in the gray dust of the canyon trail. Except for the slow heaving of his sides and an occasional flick of an ear, he seemed part of the dust and the ageless limestone that rose in great towering battlements behind him. The sun had been shining fiercely on his belly and now began climbing up over his sides, then slowly up the canyon wall. But for a long time the rocks held their heat and the solitary figure dozed on. A ground squirrel peered out from a chink in the wall, watching a moment with friendly eyes, then dived back where it came from. A cottontail rabbit played hop, skip, and jump around him. But nothing disturbed the little gray lump, not even a nuthatch hammering away at a juniper tree. It was the wind, an uprising current of wind from the depths of the canyon, that finally aroused him. It whirled up his nose and down his ears, tickling him awake. With a grunting sigh he began rolling, and with each turn just missed falling off his ledge into Bright Angel Creek, hundreds of feet below. Now he sat up on his haunches, squirming his back against the rough, warm limestone. He gave a luxurious yawn and gazed at the opposite wall as if in search of some creature like himself. But there was only rock, rising sheer and lonely to the sky. He stretched his forelegs and then he was up, shaking the dust from his coat. Over the ledge a few spears of bunch grass grew in a crevice. He leaned out into space and cropped them, jaws swinging sideways as he chewed, while his eyes, from under their thatched roof of hair, looked out over his world. It was a world of rock piled up and up, layer on layer to the sky, and down and down to the Colorado River far below. Instantly the canyon took up the cry. South wall to north and back again it banged and bounced the bray until there was nothing left of it. The burro waited, listening. His ears probed the white spot as if to pull something out of it. There it was! An answering sound! A bellowing halloa, almost as big and brassy as his own. It set the little burro into action. Down the trail he plunged, zigzagging from ledge to ledge, ears flopping, tail swinging, hoofs toe-dancing the narrow path. Once on his way, a kind of momentum took hold of him and he fairly flew, rounding one cliff only to face another. Time and again he crossed Bright Angel Creek, a foaming mountain stream that tumbled downward to the river. For yards and yards he walked in its bed, picking his way around the glossy boulders. But he neither drank nor played in the water. Only once did he stop to study his goal. The white spot had grown to a tent, and nearby, campfire smoke was curling upward. Satisfied, he plunged on again, always traveling within sight and sound of the busy creek. The afternoon was late and purple shadows were spilling down the canyon walls when he came at last upon the source of the smoke. An old, old prospector with flowing white hair was piling driftwood on a fire. And beside the fire stood an iron skillet and a bowl of yellow batter.